New trends in luxury home conveniences like outdoor dog showers and customized candy machines are being introduced to the luxury market. But still, there are several features that never go out of style. Here are some of them. 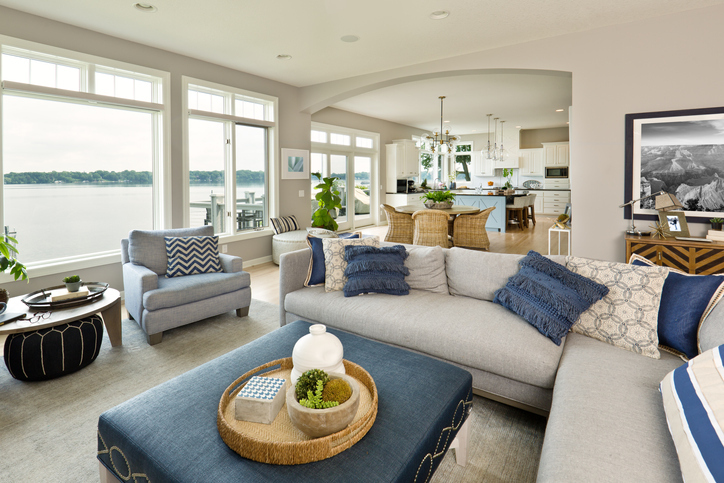 A Coldwell Banker survey revealed that open floor plans are in high demand among top-tier buyers. They prefer a single, expansive space where members of the household can interact with each other while going about with their business. Moreover, buyers no longer seethe kitchen, dining room, and living room as formal, separate spaces. The act of preparing meals in the kitchen –out of sight of guests –and bringing food to a dedicated dining room is a thing of the past. Open floor plans are ideal for entertaining, and luxury buyers want homes where they can show off their cooking skills while talking to their guests. Outdoor space is the ultimate luxury, especially in a coveted area like Smith Mountain Lake. Spacious yards, viewing decks, outdoor kitchens, BBQ grills, and comfortable seating and dining areas are requisites for a luxury home. These features allow buyers to enjoy SML’s unique lakeside setting. High-profile buyers also want a seamless transition between indoor and outdoor areas with the illusion of a large, singular space. This seamlessness is often achieved with the use of glass panel doors, flooring material, and overhead structures. It’s not enough for luxury bathrooms to have trendy avant-garde fixtures and marble counters. Luxury buyers want to feel like they’re stepping into a spa when they walk through the door. This means large, jetted tubs and walk-in showers with multiple showerheads and sprays. Massive vanities, plush chairs, and motion sensor faucets complete the package. The kitchen is the heart of the home, and luxury buyers expect no less than high-end appliances. The growing popularity of cooking and restaurant management shows has also created a demand for specialty appliances like convection ovens and steamers. In other words, if it’s good enough for a chef, then it should be good enough for top-tier buyers. Large kitchen islands are the norm, as is custom cabinetry with pullout drawers. Storage space in the form of walk-in pantries is also a must for luxury buyers. Wine cellars are no longer just meant for storage – they now serve as showpieces that put the homeowner’s personal collection on full display. Glass cases with custom lighting can draw guests’ attention to rare vintages. These cellars also double as tasting rooms where guests can sit down and sample wines from the collection. That means comfortable seating, proper ventilation, and a full entertainment system with sound and flat-screen TVs. Car collectors need garages that double as showrooms that will allow them to put their vehicles on display. Most showroom garages can accommodate 16 to 20 cars, depending on the design. These are ideal spaces for entertaining, with seating areas, bars, pool tables, surround sound systems, and flat-screen TVs. These garages are also equipped with sophisticated security systems to help safeguard valuable cars. Putting a luxury home in the market? Let me, Jane Sullivan Horne, help you find qualified buyers. Call me at 540.493.1690 or send an email to Jane(at)JaneAtTheLake(dotted)com.